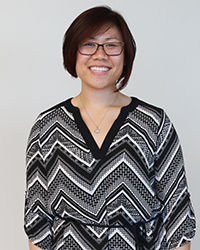 When she began her journey at UC Merced, Sheena Truong had the future planned out. She’d graduate, go to dental school and become an orthodontist. But Merced had more to offer — and in a roundabout way, it became her destination. In her third year at UC Merced, Truong realized that meeting the basic requirements for dental school admission might not be enough to get accepted to a top school. She needed to stand out from the crowd. “I thought, ‘What would make me a competitive applicant?’” she said. Truong enjoyed physics and building things, so she switched her major from management to mechanical engineering and took advantage of research opportunities in the plasma gasification lab with Professor Gerardo Diaz and research scientist Edbertho Leal-Quiros. Diaz and Leal-Quiros also instilled the importance of documentation, a skill Truong carries with her today. Upon graduating in May 2012, Truong began an internship at a dental office in Merced. While she enjoyed the experience, it was during that time she realized her ambition had changed. Truong spent two terms with AmeriCorps, a national service network supported by the federal government, performing patient education at Golden Valley Health Centers in Merced. After two years and more than 3,600 hours of service, she was hired on as a full-time employee. During her first eight months, she helped implement the center’s patient portal, which allows patients to access health care online. This included research in the form of reading and speaking to patients to understand their communication preferences. She also assisted with the portal’s marketing rollout. Once that project was complete, Truong moved to the Information Systems department as a project coordinator. Two months later, a position in HR opened up, and she jumped on the opportunity. She currently serves as training and project coordinator for 26 medical and eight dental sites in Merced and Stanislaus counties, and she hopes to complete her master’s degree in health care informatics from Grand Canyon University in October. Truong plans to use her education, along with the leadership and human resources skills she’s acquired, to operate a nonprofit organization specializing in oral health and nutrition for the local underserved population. The San Francisco native has put down roots in Merced and is already making a difference. She hopes more UC Merced alumni will do the same. “The students who do stay in the community offer a lot,” Truong said. “When the students go out and see what’s here and the need, that need becomes a job.